Excerpts from the Globe's environmental blog. 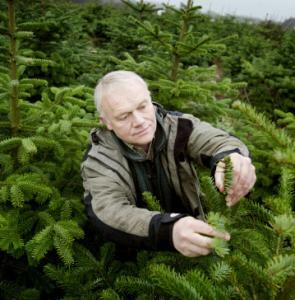 'Tis the season for the green debate over Christmas trees - and which is best, real or fake? The American Christmas Tree Association (which represents the artificial tree industry) says the greenest choice is to buy a fake tree. The National Christmas Tree Association (which represents tree growers) says the best choice is real. We asked some specialists, scoured the Web, and came up with what we hope will be an unbiased guide. So first the fake tree: It sounds good, right? A one-time purchase that doesn't involve cutting down trees - and one that can be reused for years. The American Christmas Tree Association commissioned a study that says (surprise!) a consumer buying an artificial Christmas tree had a smaller carbon footprint over a 10-year use period than buying live trees. You can guess what the National Christmas Tree Association says. But it seems the specialists agree with the farmers. Artificial trees are manufactured with polyvinyl chloride (PVC), which does not break down in the environment. Lead is sometimes used as a stabilizer in the plastic. The trees are shipped from China (which means a lot more greenhouse gases to get them here) and they tend to last, on average, about six years. "For the environmentally conscious consumer, a live Christmas tree is preferable to artificial," said Clint Springer, a botanist at Saint Joseph's University in Philadelphia in a press release about the subject. He says that the live tree purchase also injects money into the economy - and everyone knows we need that now. Travelers on Interstate 93 might spy a bit of sparkle coming off the roof of Boston Sand & Gravel Co's maintenance facility in Charlestown. The company recently unveiled a 109 kilowatt solar-power system - the largest to be built under the state's new Commonwealth Solar initiative. "We've got some serious leadership coming out of them," Ian Bowles, secretary of the state's Executive Office of Energy and Environmental Affairs, said of Boston Sand & Gravel, which he called one of the "old line, traditional industries" not often associated with renewable energy efforts. The more than 550-panel system covers about 22,000 square feet and is expected to generate about 75 percent of the maintenance facility's annual power needs.